I am in the process of refurbishing my 8" f8 1960s Edscorp reflector on the "super duper" heavy duty mount. When I got it, the mount motor drive was completely locked up. I have since taken it completely apart and re-greased it. Everything now moves very smoothly, but the mount does not engage and track. So - now I need to know how this drive works. 1. The motor works. The assembly below works - you can see the worm-drive shaft rotate. 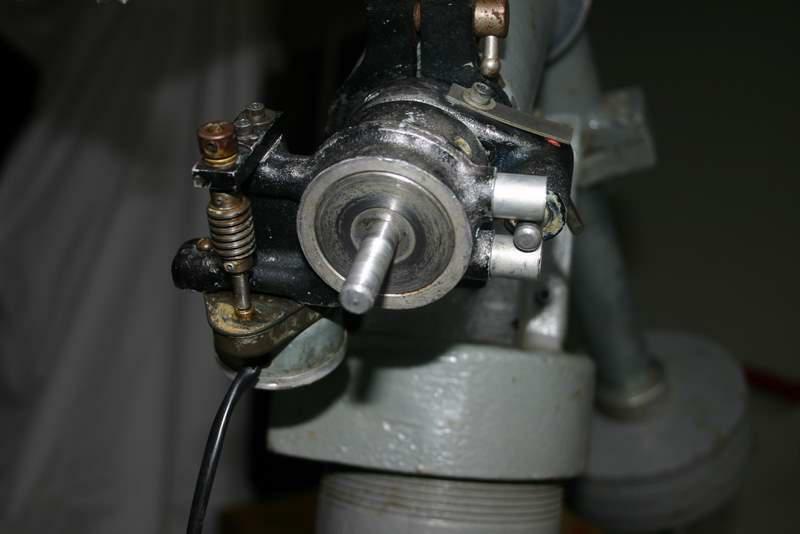 The above motor housing slides up the shaft, and the drive gear engages with the worm gear. There are two thin nuts which screw onto the black threaded rods in the picture (those aren't pictured here). Here you can see a picture of the assembled motor drive. I'll include a few pictures from several different angles. Do you have pictures of the rest of the drive ? The main 96 tooth gear is on clutch. Is the clutch adjusted correctly? There are either two thumb screws to adjust the pressure or a "Nylok" nut. The two silver pins on the bottom of the assembly that your holding has another pin on an eccentric that fits between them and has an adjustment arm attached. 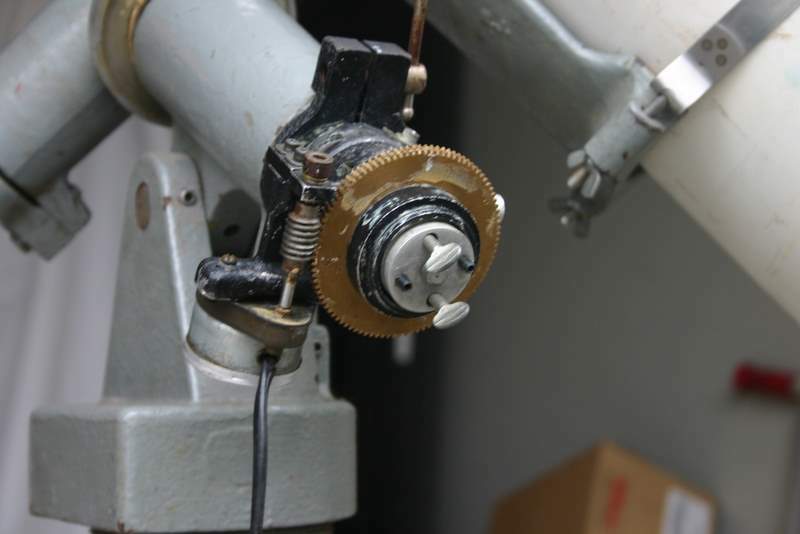 By rotating this adjustment arm one can make fine adjustments to the position of the object in the eyepiece. 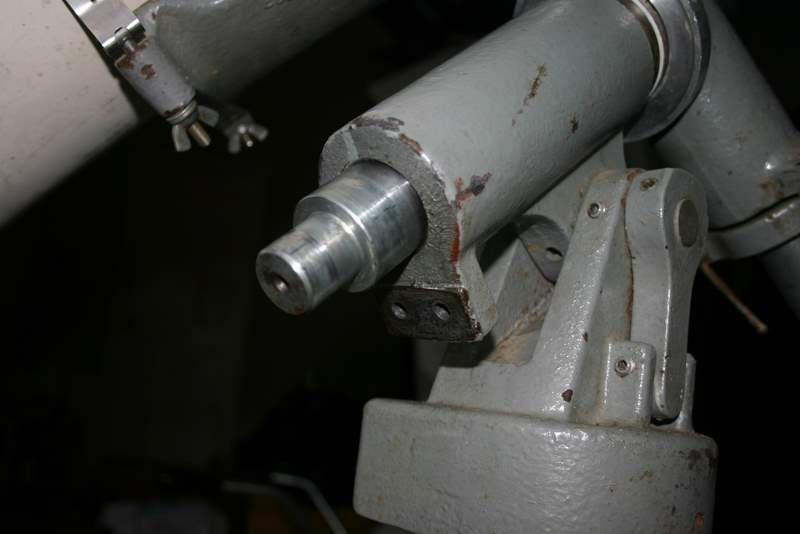 The two silver pins are also mounted on eccentrics and need to be adjusted so there is no play between them and the center pin with the adjustment arm. 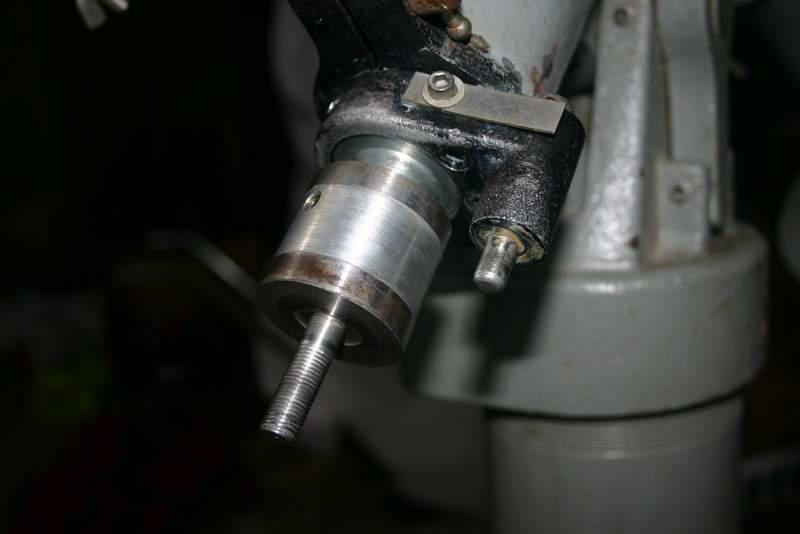 The end piece with the thumb screws will screw in or out on the threaded knob on the end of the drive shaft. By unscrewing this, the end assembly can be removed. I am assuming that this might serve as some type of clutch mechanism, pushing against the drive gear. Here is a pic of the end pieces. Here is a pic of the end shaft with the pieces removed. The gear is not threaded - it slides up the threaded shaft to the smooth portion of the smaller shaft, pressing against the larger part of the shaft. but the shaft is not your clutch is slipping. until you can still turn mount by hand but the motor will grab enough to turn the shaft. did you have nuts on those bolts on the end of your shaft. i put a mark in the gear so you can tell its turning. more about this mount than me. It's been a while since I've seen one of these, so I may be wrong, but I seem to recall there being a large leather washer between the the clutch and the drine gear.I don't see one in your setup. That may be your problem. I was posting when you were loading up the pictures. I think see the problem. There is suppose to be a "Nylok" type locking nut on the bolt between the two thumb screws. It pushes up against the clutch plate. Also be sure the 'scope is well balanced. When the drive is removed the 'scope balance the 'scope. Again be sure that there is no play between the fine adjustment pin that has the little arm attached and the two pins on either side of it. It takes a long time for the drive to take up any play, with the motor turning at 1 rev. in 15 minutes. OK...double check to make sure the drive motor housing is free to allow the main shaft to turn freely within it. 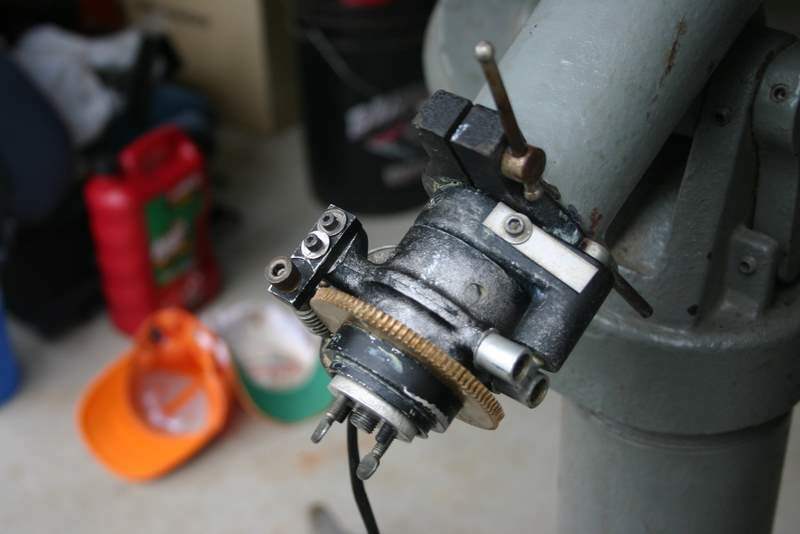 Just unlock the RA shaft knob and see if it rotates freely with the drive motor in place. Then replace your ring gear and check to see that it is not pressing up against the drive motor housing...if it is this will bind the ring gear against the drive motor housing not allowing the shaft to turn when the gear is engaging the clutch. There needs to be adequate clearnace for the ring gear to press against the RA shaft, but freely spin. It is the clutch.. and the clutch plate applies pressure against it and it, against the RA shaft. 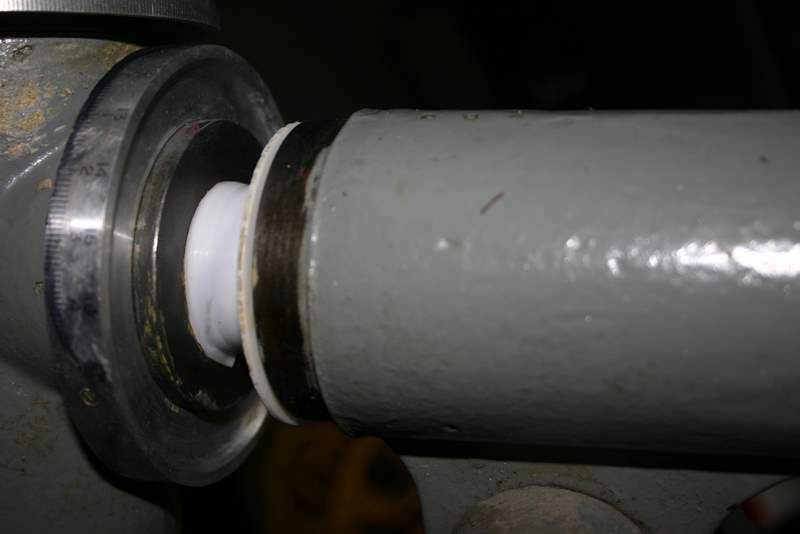 Once there is adequate contact the drive motor will turn the ring gear and subsequently the RA shaft. If the ring gear is contacting the drive motor housing...you'll bind. Thanks guys for the pointers. When I got this the shaft was practically locked up, and the motor mount was locked up solidly to the shaft. So I took everything apart all they way up to the top bracket (which - by the way, has a small ball bearing on top of it that I had to put the mount upside down to re-install correctly). Everything turns very smoothly now. I didn't know what should be tight, and what should move. 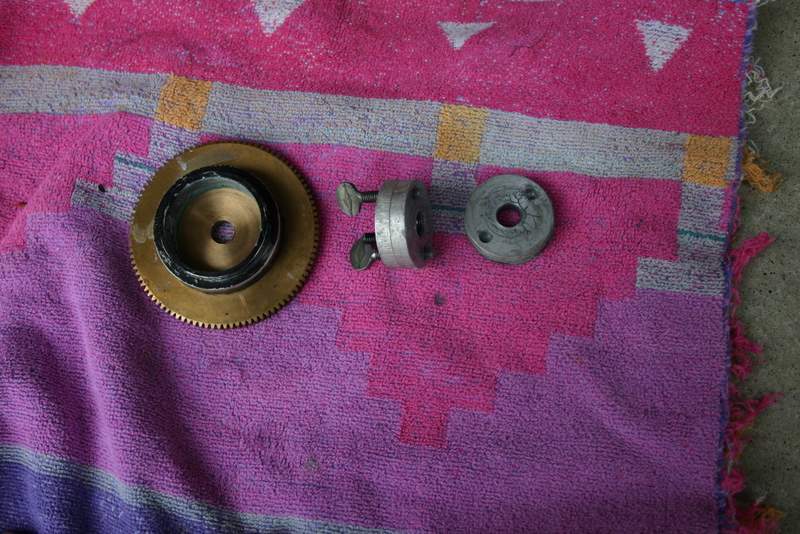 I did have the leather washer, and it is on the piece of the clutch that pushes against the gear. I took it off and wiped it down, and put it back in. 2. The two small black threaded rods actually thread all the way through the first of the three clutch pieces, I tightened them down against the knob behind. 3. I found a nut that fit the center bolt, and tightened down the clutch assembly, then tightened down the nut a bit. 4. I made sure that the fine adjustment knob was tight against the shaft. I drew a line on the clutch gear, and lined it up with one of the screws on the worm gear. After several minutes, you could clearly see that the gear has turned. The gear turned, but the shaft and scope did not turn. I have tightened things down a bit, and will try again. I'll let it run for 15 minutes and then see if there is a change in shaft position. Cool . From what I understand the stock clutch is a real bear. Mine is somewhat...different . Yours has a disk or wheel on the end of it - right? So how much do you tighten it down when you engage the clutch? 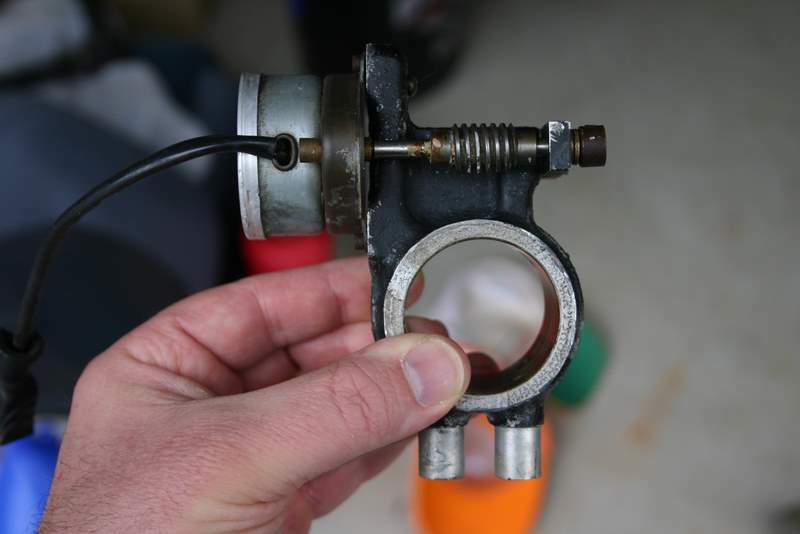 Its literally a plumbing handwheel . It was retrofitted by the priest who originally bought the scope. I'll post a pic in a bit. Right now its not much to engage or disengage...maybe a turn and a half for full disengagement. Ben, sounds like you might need to ask Keith for the name of that priest to do a exorcism on your drive. Let us know how it comes out! How is this clock drive attached to the RA casting? I am looking at my drive which is the same as yours and it is mounted to a 1.5" stub on the casting with set screws, on the smaller Edmund mount. If I tried to put this drive on my large Edmund mount the 1.5" shaft is where the casting stub would be and the whole drive assy. would be mounted and rotating with the shaft! Can I see a picture of your mount with no drive, or the back of the drive casting? I had a similar problem recently with a 10" Starfinder. The motor ran and turned the worm - until a load was applied. It apparently had weak windings and insufficient torque to drive the scope. 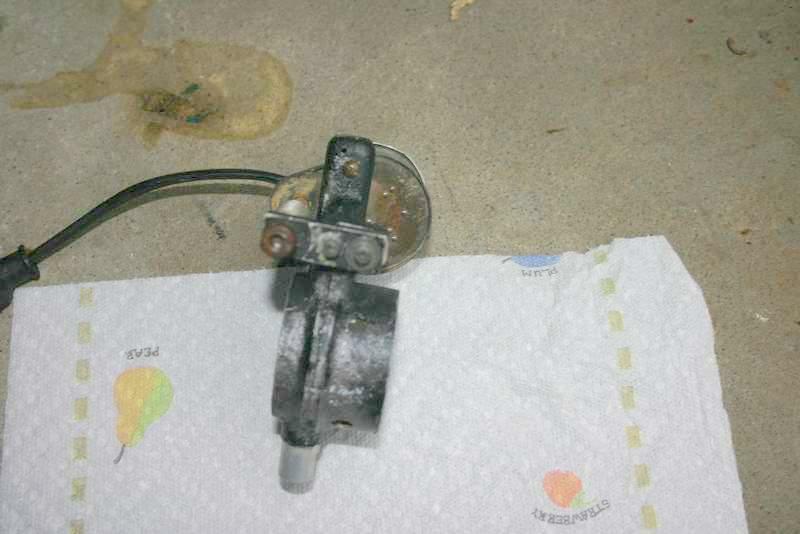 The motor was the old 1/10 RPM Cramer so common in the earlier EQ drives. A replacement motor cleared mine up. First - I am glad you asked for these pics. I found I hadn't cleaned the bearing surfaces pictured here at the top of the shaft. 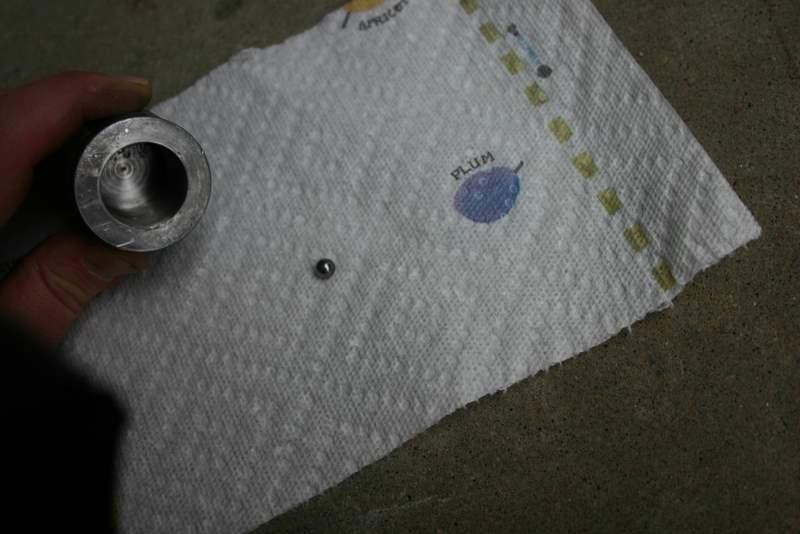 The shaft floats on a teflon sleeve, as well as the teflon disk. Here is the bottom of the shaft, with the drive assembly completely removed. At the bottom, the shaft steps down from 1.5" to 1" at the end. You can also see two bolt holes that the first piece of the drive bolts to. Here, the first piece of the motor mount is shown. It has a 2" diameter hole. It slides up and bolts into the two bolt holes, locking this piece to the mount's frame. 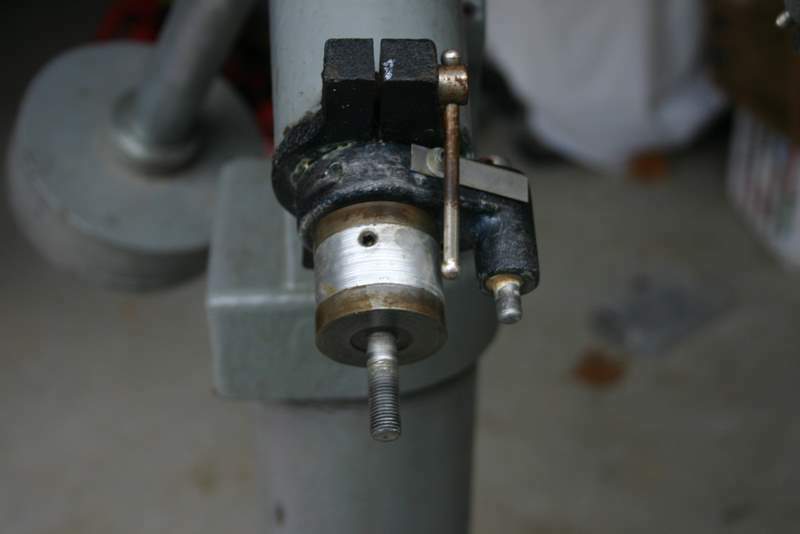 This piece has the clamp for locking the shaft down, and on the right in the picture is the end of the fine adjusting knob, which will move the mount just a bit to center an object. This is an 8" f8 OTA, so the eyepiece is a solid 46" away from the control rod. Unfortunately for this design, my hand is only 36" away from my eye, so I haven't figured out exactly how you are supposed to use the "fine adjustment knob"
The next piece is an end flange that fits over the 1" end of the shaft. It is threaded on the other end. There is also a small ball bearing that fits into the hole on the end of the shaft. 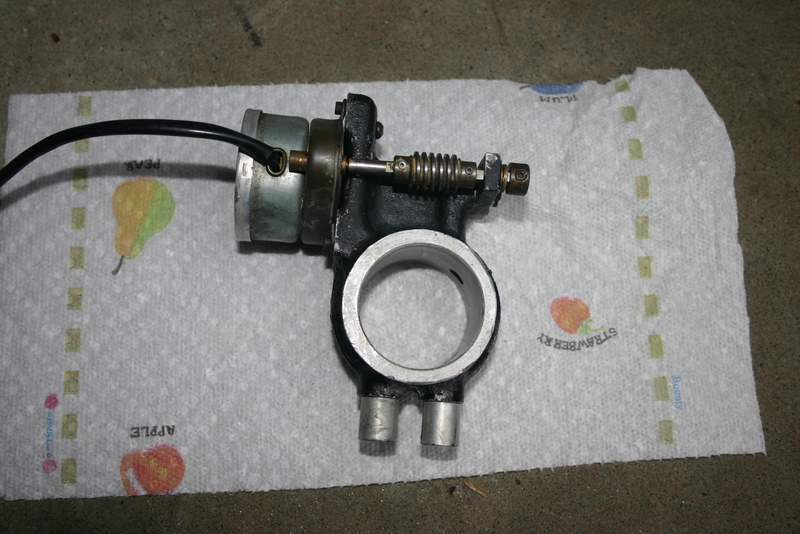 You actually have to move the mount and shaft so that it is angled up in order to re-install the ball bearing. Here is the end flange on the 1" shaft. I haven't pushed it all the way up yet - it fits all the way at the top with no gap. It has two hex screws in the flange that bolt the assembly to the shaft. So - again what does that ball bearing do exactly? Here is the motor assembly. It has a 2" hole, and slides on top of the end flange. At the bottom of the assembly in the picture are two short rods. These will fit on both sides of the fine adjusting knob. The fine adjusting knob is bolted onto the mount frame, so it won't turn. When the motor assembly slides on, the two short rogs fit on both sides of the fine adjustming knob. This locks the motor assembly down so it doesn't rotate, and puts the worm gear into the correct position to mount up to the drive gear. This view shows the side of the motor assembly. The worm gear can be tightened or loosened just a very tiny bit via the bolt on top of the gear (pictured on the left side). There are two hex nuts (hard to see, on the right side) that hold a small mounting plate in place. 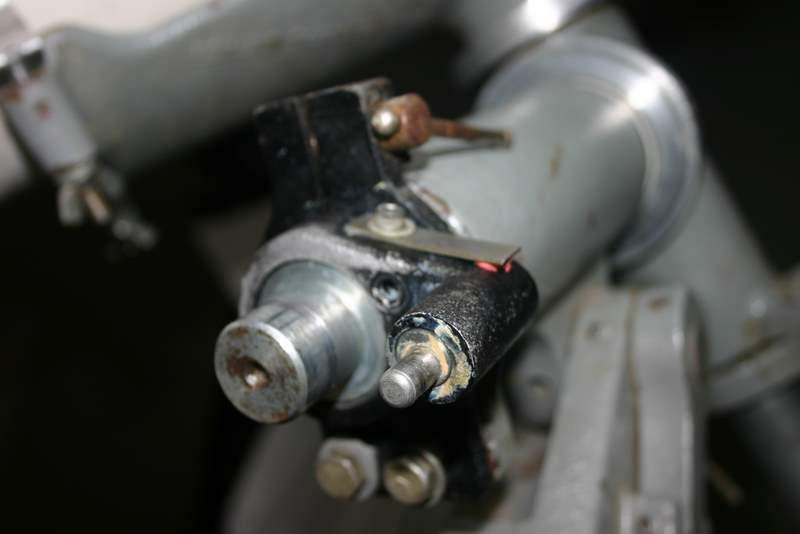 Here, the motor mount is pushed up onto the flange, with the rods positioned around the fine adjusting knob. The assembly is only held in place by friction from the adjusting knob. It only locks in place when the clutch disks are screwed down.